Handyman.Wales are specialists in all makes and models of macerator repairs and installations. We charge £80.00 for first hour and £40 per hour thereafter for a macerator repair. 7 days a week. Any replacement parts fitted or descalers used will be charged in addition charge. It is recommended that Saniflo Descaler is used for up to 3-4 times per year depending on water hardness in your area. A lot of macerator start stop problems are due to limescale build up, if you use Saniflo Descaler when you have a new Saniflo installed it keeps the limescale away. If you don’t use the Descaler you will start to experience problems around the 4-5 mark. If you don’t descale a Saniflo system they can give off bad odours which can be unpleasant. Bleach or other toilet cleaning chemicals or kettle descalers do not descale a Saniflo or any other macerator pump, all they do is damage the rubber internal parts and can cause shrinkage. 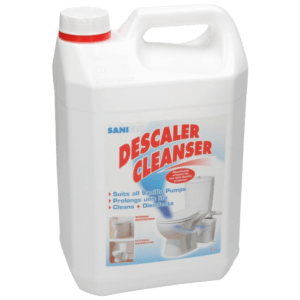 Saniflo Descaler is a phosphoric based descaler especially formulated for Saniflo and other macerator pumps. Saniflo descaler does the job and we can vouch for the product. We can descale your Saniflo Macerator pump for £90.00 including Saniflo Descaler Cleanser and labour.